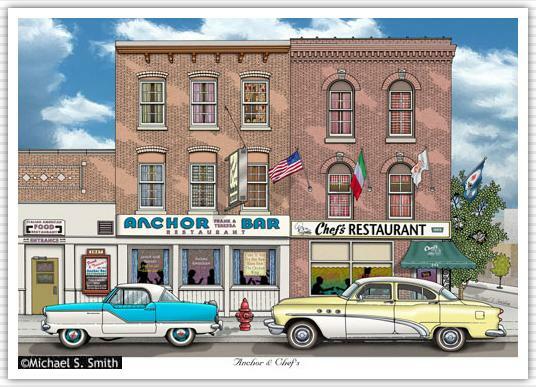 The Anchor Bar and Chef’s Restaurant are two of Buffalo, NY’s best known eateries. Established in 1935, the Anchor Bar is best known for it’s creation of the now famous chicken wing in the 1960’s. Chef’s Restaurant opened in 1923 and has gone through several expansions over the years. Best known for their invention of Spaghetti Parmesan in 1962. A late 50’s Nash Metropolitan and a 1953 Buick Special are parked out front.